The picture above is based on the total of books published by each of the authors who contributed to the legendary “Spécial Police” Series. Launched in 1949 it helped turning its publishing house, Fleuve Noir, into France’s most successful popular literature publisher. When it stopped, in 1987 it had published generations of new authors. The biggest names on the words representation above are the biggest contributors. Georges J. Arnaud, Mario Ropp (aka Maïa Devillers), Peter Randa (aka André Duquesne), Adam Saint Moore (aka Jacques Douyau) and of course San-Antonio (aka Frédéric Dard) feature here prominently. 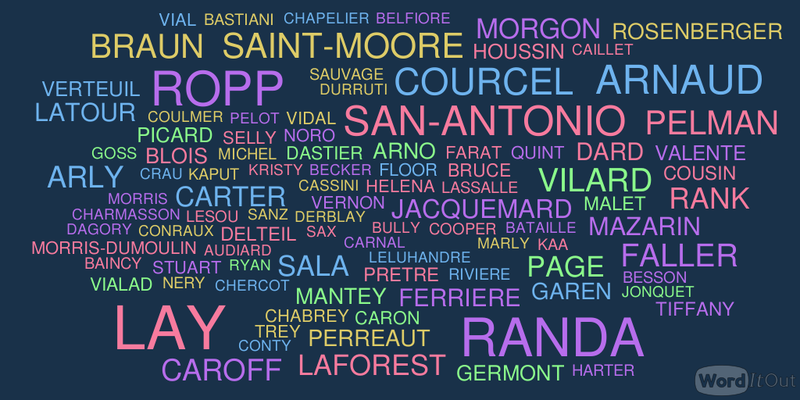 But many important names in the history of French Noir, as well as those of well-liked, prolific authors can be found here too. André Helena, Léo Malet, Serge Laforest, Jean Mazarin, Roger Vilard, M.G. Braun (aka Maurice-Gabriel Brault), André Lay and many more.